On the morning of Saturday 10th December 2005 the 1st Sedgley Scout group raised the village flag outside Somerfield supermarket in Dudley Street. 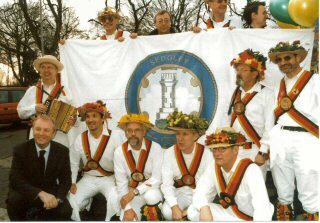 Sedgley Morris Men entertained the crowd and Dudley North MP, Ian Austin, joined the group photograph to celebrate the occasion. The chairman of Sedgley Business & Community Association, Adam Williss, [next to the balloons], masterminded the project and urged traders to give financial support. 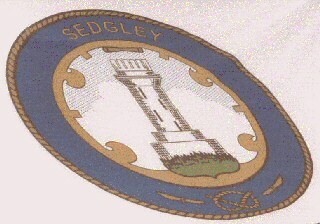 The flag’s design is based on the late Victorian civic badge of the defunct Sedgley Urban District Council. The Beacon Tower, surrounded by a blue annulus edged with rope and a lock barrel used in safe making, takes pride of place. At the base are two pen nibs and the Staffordshire Knot, or more correctly the Stafford Knot. The former represent the village’s claim to the invention of steel nibs around 1800. The professionally made double sided flag fashioned from forty square feet of material will fly every day except on special occasions when the Union flag will be raised.